Editor’s note: This is the first of a two-part article about how Gradian Health Systems harnesses a seldom-used business model to manufacture, sell, distribute and support its anesthesia machine. Check out part two here. These articles are part of the market dynamics initiative on NextBillion Health Care. The ongoing series looks to encourage discussion and understanding around how markets impact health outcomes. Click here to read other articles in the series and here to read an explanation of market dynamics as a concept and practice. My organization, Gradian Health Systems, uses an atypical business model to get our product into the hands of those who could benefit from it. We produce a unique medical device, the Universal Anaesthesia Machine (UAM), which is designed to provide anesthesia in any environment -– including infrastructure-poor hospitals that lack consistent access to electricity or compressed oxygen (necessary to run typical anesthesia machines). The model we use to manufacture, sell, distribute and support the UAM, foundation-owned social enterprise – more technically, a limited liability corporation wholly owned by a 501(c)3 private foundation – is a novel means to combine the best features of philanthropy with the best features of business. It allows us to serve as a commercial entity using market mechanisms to sell a product, and as a nonprofit using philanthropic dollars to address significant market failures. To understand why we use this model, you really need to understand the challenges that low-income country markets create for medical equipment manufacturers and why conventional models haven’t worked. In high-income countries, medical device manufacturers have developed an effective and lucrative business model predicated on accessing multiple revenue streams. As you’d expect, the initial sale is one such stream, but lesser-known complements are the sale of a high-margin, long-term service contract and the recurring purchases of (often proprietary) spare parts and consumables. And the model works. In these markets, strong infrastructure and a robust supply chain ensure comparatively low prices for proprietary spare parts and consumables – all of which hospitals can afford. Just as critically, facilities and regions have a deep supply of highly trained biomedical engineers to fix the often quite intricate and sophisticated devices. In low-income countries, though, a dearth of hard and soft infrastructure strains this model to its breaking point. 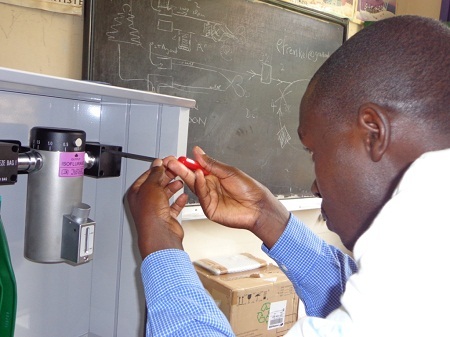 To take just one concern, it can be very difficult to find biomedical engineers trained to maintain and repair intricate and sophisticated devices; there are nine in Malawi, for example. Bringing in outside expertise is a time-consuming and expensive process, leading to long inoperability periods and high costs for already cash-strapped hospitals. And all of this assumes that the product is right for the environment, which, as I’ve discussed before, simply isn’t the case for low-resource environments. Even if a hospital can pay for spare parts, consumables and repair, a machine that requires compressed oxygen still won’t consistently function in a hospital that often runs out of it. Organizations not seeking to profit when trying to fill this gap have thus far generally failed to do so in a cost-effective and sustainable way. The most common model we’ve seen to address this low capacity to pay is to donate used, second-hand equipment (which I’ve written about previously for The Atlantic). This donation model is problematic for two reasons. First, like the new, for-sale equipment described above, most used, donated equipment simply isn’t designed to function in infrastructure-poor environments. And second, sometimes donated equipment is positively ancient and simply should not have been donated in the first place; an old, out-of-production machine likely won’t have spare parts or consumables in production, making them more difficult to source. The end result of these models is a staggering percentage of inoperable medical equipment in low-resource environments. Estimates vary, but 40 percent to 80 percent of medical equipment in sub-Saharan Africa is considered non-functional. This makes us believe that there is a significant market failure in the manufacture and sale of medical devices in low-resource countries; improper devices are being sold or donated and are largely failing to serve the communities in which they’re placed. We think it’s time for a new solution. Foundation-owned social enterprise remixes conventional for-profit and nonprofit models to create something new. Combinatorial creativity at its finest, the model draws on the best of both business and philanthropy to sustainably address old problems. Coming tomorrow: Read about how Gradian makes its UAM available even in resource-constrained hospitals around the world, and is able to scale according to demand. Mike Miesen is a business strategy analyst at Gradian Health Systems, a nonprofit social enterprise that equips low-resource hospitals to deliver anesthesia in any environment.